OVERLAND PARK, Kansas – Federal Premium is proud to announce that two ammunition products have received the prestigious “Member Tested and Recommended” seal of approval from the members of the National Tactical Officers Association (NTOA). After extensive testing by law enforcement officials – judged on a scale from 1 to 5 – two ammunition products scored over 4, which garnered the seal of approval. The 9mm Luger 150gr HST JHP Centerfire Pistol Cartridges received a score of 4.62, and the .223 REM 55gr Tactical Ballistic TIP Centerfire Rifle Cartridges received a score of 4.50. Rigorously tested in the field by law enforcement professionals, products that earn the members of the NTOA’s seal of approval are listed on the association’s comprehensive online database and some will be included in the quarterly journal, The Tactical Edge. 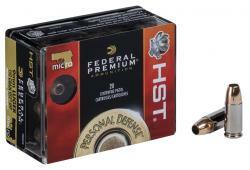 Federal Premium Personal Defense HST 9mm Luger offers everything needed in a personal defense round: consistent expansion, optimum penetration and superior terminal performance. That’s why it’s already the duty load of choice for law enforcement officers throughout the world. With the popularity of modern sporting rifles, the 223 Rem. has become one of the most widely used rifle cartridges. Loaded with the right bullet, it can serve for hunting, target shooting and more. Federal Premium is a brand of Vista Outdoor, an outdoor sports and recreation company. For more information on Federal Premium, go to www.federalpremium.com.